Sumptuous cheese corn balls served with buttered parsley rice, glazed vegetables topped with a red wine flavoured tomato sauce. You can serve pasta instead of the rice if you prefer. Italian cooking is wholesome and flavourful. This sizzler is a hearty combination of pasta tossed in a robust mushroom and black pepper sauce and served with zucchini pancakes. Buttered vegetables and a perfectly baked potato topped with a knob of butter complete this meal. 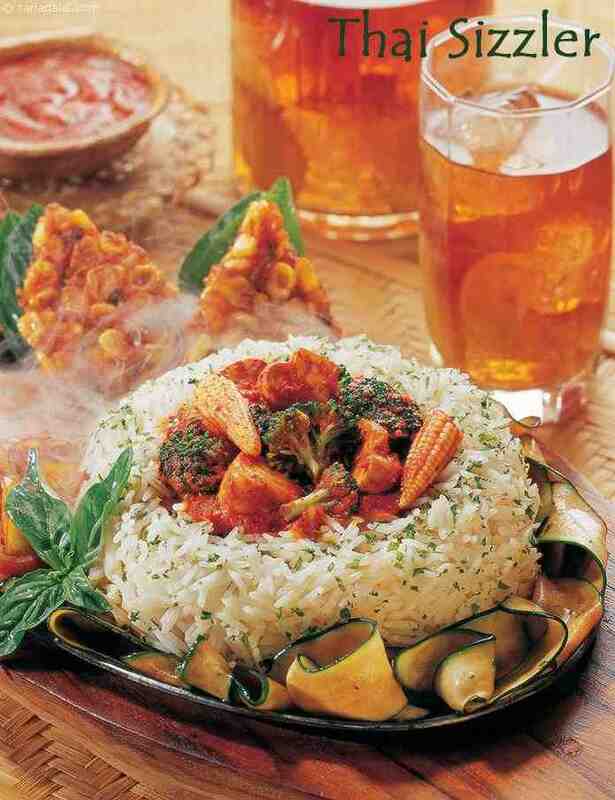 Thai cooking is a tempting blend of Indian, Chinese and Malay cooking. Varying form the soothing coconut to fiery chillies, these flavours of Thailand on one platter are sure to stimulate your taste buds and your appetite too! Let's journey to mexico. . . . . . The land of tacos and tequila. This sizzler is a fiery combination of veggie filled tortillas served with a stir-fry and spicy papri flavoured mashed potatoes. A food sizzler which children will love. Tender asparagus and baby corn topped with a paprika flavoured cheese sauce. It makes an interesting starter to serve with aperitifs. Succulent falafel patties combined with bean and spinach rice topped with hot sauce and vegetables are assembled to give you a sizzling extravagance. A rich, gooey, sinful and truly indulgent dessert. Warm, fudgy walnut brownies served with rum marinated fruits, drizzled with chocolate sauce that is streaked with fresh cream. And what is a brownie served without the mandatory scoop of vanilla ice-cream. So dig in and indulge. This sizzler is laden with a bounty of flavours and spices. A delicately flavoured rice noodle preparation is topped with a smoky, curry flavoured satay, grilled and served with a spicy-sweet peanut sauce and crispy potatoes. Barbequed buttery bananas, served with brandy marinated fruits that are served with vanilla ice-cream. Add a dollop of chocolate sauce if you like.